Warmer weather doesn't always = un-hunched shoulders, thanks to that pesky thing known as the 12-month American work ethic. Neither does vacation, especially when you pick some tourist-saturated destination that presses your misanthropy buttons. Sometimes to get away, you *really* have to get away, be it remote beach or rugged mountain retreat, little-known wine trail or in-city spa escape. Why it's so great: For starters, you have to take a boat or seaplane to get there. 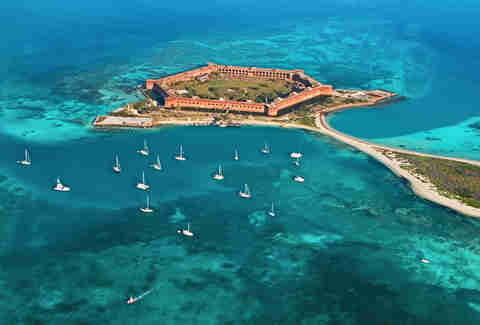 Located 70 miles off Key West, the Dry Tortugas were first discovered by Ponce de Leon back in the 1500s ("tortuga" means turtle, and Leon found a shitload there). Today the national park gives you both history (Fort Jefferson once housed Samuel Mudd, the doctor who treated Abraham Lincoln's assassin) and vitamin sea aplenty. Never mind that the beaches are dotted with abandoned vessels from asylum-seeking Cubans. 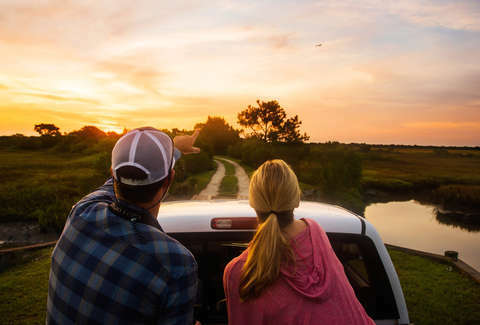 Why it's so great: The Outer Banks are an obvious exhale spot, but Carova, the northernmost outpost, is especially serene, given that it's about as far out on the banks as you can get. There are no hotels or stores, just vacation homes, and you need a 4x4 vehicle just to get there (the "roads" are really just sand). And it's 100% about the beach here: 11 miles of it, fairly quiet even in summer, where you can swim the always-temperate waters, surf, paddleboard, or do a whole lotta nothing. Must-do: Two words: wild horses. The Carova wild mustangs wander all over the island, so you're likely to spend a fair bit of time assembling the perfect IG collage. 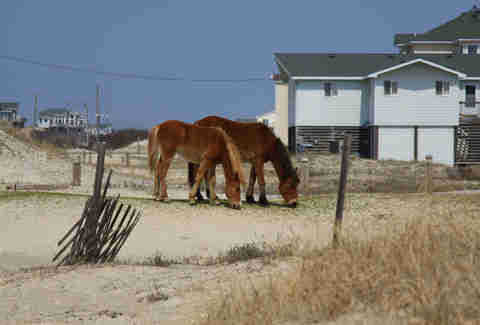 Just keep your distance: the horses are feral, so there's no Black Stallion-style bonding going on. Why it's so great: Your first adult Goonies re-viewing probably got you all excited about Northwest beaches (anything to distract from the Sloth subplot). 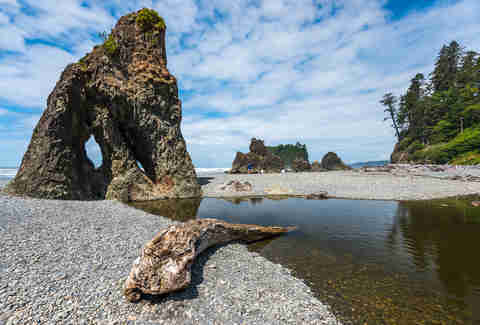 The 73 miles of protected Olympic coastline are a terrific entry point: camping is the preferred lodging, and coastal hiking, kayaking, and bird watching are some of the preferred low-key activities (and swimming too, of course, as long as you respect the tides). Must-do: Kalaloch Lodge is a rustic, coastal retreat that has to be stayed in to be believed. Just sit in one of the Adirondacks overlooking the ocean and dare yourself not to relax. 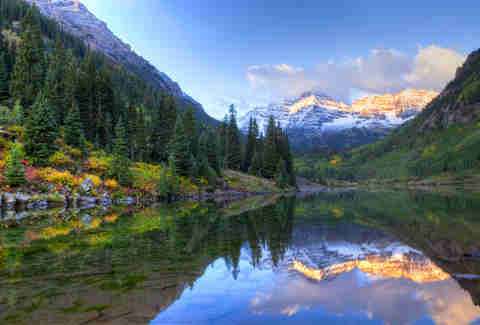 Why it's so great: Snowmass is irrefutable proof that ski resorts are sometimes better in the summer. For starters, it's irrefutably gorgeous in the warm-weather months, what with that lack of snow revealing picturesque mountain vistas. And the outdoor activity lineup might just cause you to cancel that overpriced Grand Canyon jaunt: mountain biking, fly fishing, whitewater rafting, golfing, rock climbing, and horseback riding (plus gondola rides for the lazy and/or exhausted). Must-do: We're going to have to go with the rodeo (every Wednesday night, June to August), a tradition that starts with barbecue and cocktails (full rodeo bar!) and ends with roasted marshmallows around a communal campfire, with all the expected trappings -- bull riding, barrel racing, roping demos -- in between. 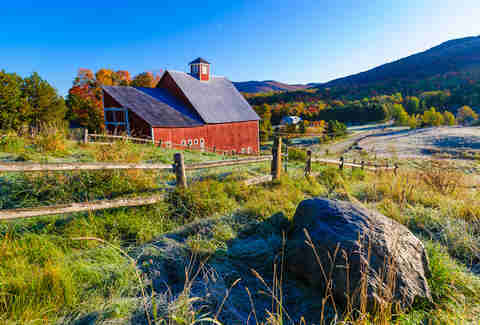 Why it's so great: Because it's quintessential Vermont. You have mountains, you have rivers, you have covered bridges, you have mountain biking and horseback riding, you have ski resorts that turn into spa getaways, you have ski mountains that turn into summertime hikes. You have farm-to-table restaurants, you have local breweries, you have the friendliest folks New England has to offer, and you have Ben & Jerry's nearby. Must-do: Field Guide, the area's newest boutique hotel, gives you that hidden-lodge vibe, complete with video games in the lounge area, a pool area with fire pit and lounge chairs, and a comfort-fare restaurant and bar, Picnic Social, slated to open any minute. The Stowe Farmers' Market goes well beyond whatever your neighborhood's dinky roadside stand provides: locally made cured meats, cheeses, sodas, and spirits, as well as lunchables and takeaway snacks. Why it's so great: This is a high-low escape if there ever was one. There are luxurious resorts, for sure, but also honky-tonk, couples-only all-inclusives with heart-shaped hot tubs. And did we mention there's a casino and a NASCAR track? 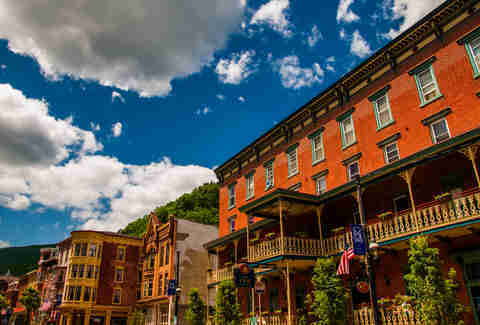 Which is to say, the Poconos let you escape from your urbane, snot-nosed self. Must-do: The agritourism trail is your best bet to dodge the minivan set -- and, oh yeah, the trail includes local breweries, wineries, and distilleries. Why it's so great: The Massachusetts outpost of this celebrated New Age-y wellness retreat chain (with locations in Tucson, Vegas, and Turkey) is far less likely to house a celebrity friend squad -- which makes it that much more relaxing. Housed in a remote, century-old Bellefontaine mansion (the original library really has to be gawked at to be believed) this is one of those twig-to-nut spa experiences you spring for when an unexpected windfall appears. Must-do: Save the socializing for dinner (calorie counting should always be a group activity). There's many a solitary activity on hand, including hiking, biking, sculling, paddleboarding, swimming in the indoor lap pool, and, of course, a million and one spa treatments. Why it's so great: We’re suckers for private retreats on private islands. 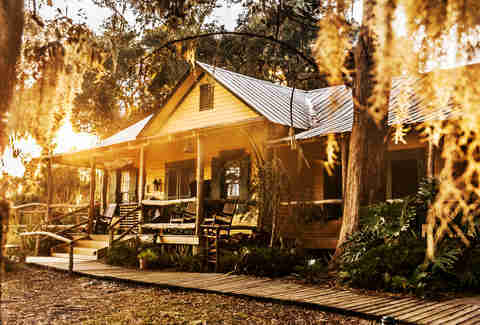 But unlike some venture capitalist-owned Caribbean isle, Georgia's Little St. Simons is rustic and naturalistic in all the best ways. Cottages are quaint and no-frills; it's about the screened-in front porches, not the amenities. The lodge prides itself on its conservation efforts, which includes a seed-to-table dining program. And all activities are nature-oriented, from birding to boating to biking along the resort's private beach (most of the island is undeveloped). Must-do: The nightly cocktail hour is a must. The Friday night oyster roast cocktail hour is a must-must. Why it's so great: "Texas all-inclusive" sounds like code for an all-you-can-eat ribs place. Travaasa is pretty much the opposite of that. The day might start with a sunrise hike, then move on to an archery session, wine tastings, a mechanical bull workout, and a harmonica lesson. Then it's organic spa time -- Travaasa's is one of the most celebrated in the US --before settling in for a communal meal of organic veggies and grilled meats. Must-do: The Prickly Pear Challenge Course has you navigating a rope course 35ft in the air while cacti sit menacingly below. That sounds relaxing, right? 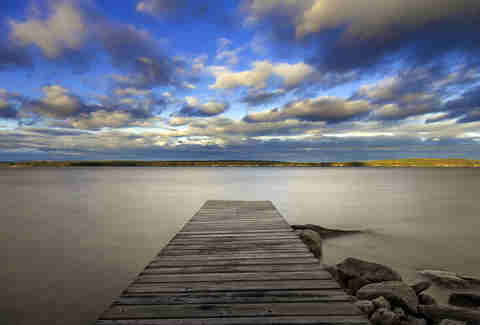 Why it's so great: How does a place so massive manage to project so much tranquility? Maybe it's the fact that ski resorts necessarily feel more chill in the summer. 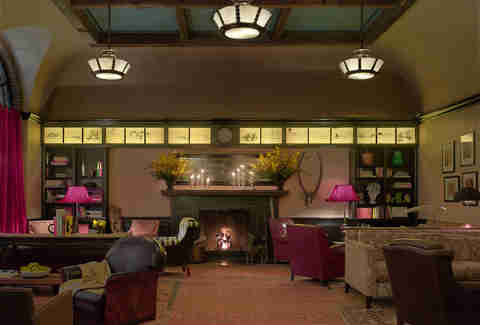 Or maybe it's because all of St. Regis' rooms have mountain views and most include fireplaces and butler service. Yeah, we think that's it. 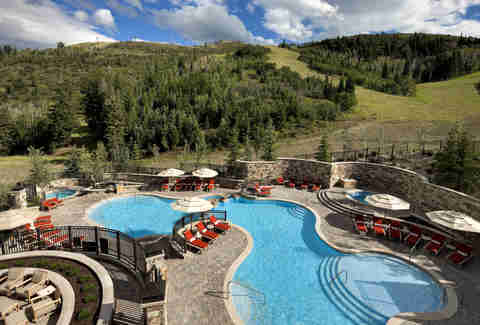 The slopeside resort also gives you access to all of Park City's summertime appeals, from hiking to fly fishing to bobsledding at the year-round Olympic Park. Or you could just retreat to the infinity pool, cocktail in hand. 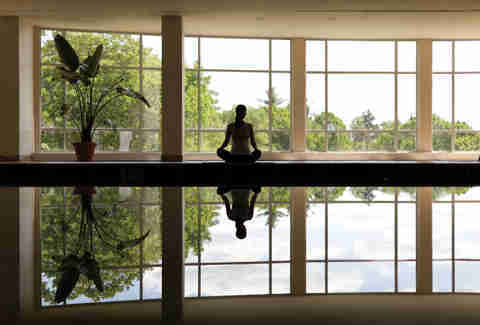 Must-do: The 14,000sqft Remede Spa feels like something out of a Bond flick. Also, there's a treatment called the Bear Dance Ritual. One should always splurge on the Bear Dance Ritual. Why it's so great: It's a five-star hotel. In Bel-Air. Where the celebs go to recharge. That's pretty much all you need to know right there. But here's some more: there are 12 acres of landscaped grounds. There's an enormous oval-shaped pool where concierges come by with ice cream sundaes before cleaning your sunglasses. There's a La Prairie spa and a Wolfgang Puck restaurant. 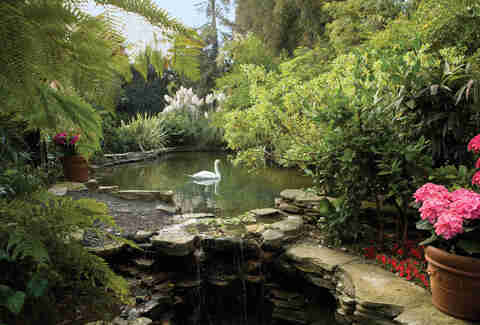 And there's a small body of water that's actually named Swan Lake, and there's usually an actual swan in it. Why it's so great: It's incredibly hard to escape within New York, but the Greenwich Hotel in Tribeca is the ticket to a weekend-long disappearing act. It's a de facto members club, complete with drawing room; private courtyard; uniquely appointed, distinctly unhotel-y rooms; and a Japanese spa with a full-size heated swimming pool. Must-do: Besides move in? You can emerge from your cocoon of decadence just long enough to sample the divine "urban Italian" cooking at Locanda Verde, the hotel restaurant. Why it's so great: Yes, there's the requisite damn-these-people-are-beautiful-and-I'm-ugly nightlife scene. But there's also an ocean-view spa where you'll linger hours after your treatment, owing to the mineral pools, eucalyptus steam baths, and marble chaise lounges. Must-do: Pool, beach. Beach, pool. Rinse, repeat. Why it's so great: Atop Nob Hill, this iconic throwback space recently got a gazillion-dollar facelift, but the over-the-top sumptuousness remains. It's all antiques and silk drapes and oversized artwork and mirrors. When you're ready to emerge from the sanctuary of your room, settle into the leather banquette seating in Big 4, the hotel's fabled dining room. Must-do: Nob Hill Spa, housed within the hotel, is its own legend. 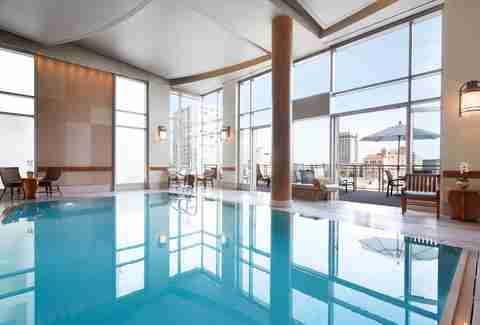 The treatments themselves are lovely, but it's the trappings that put this place over the top: a post-treatment zen room, a fireplace lounge, and a glass-encased pool overlooking the city beside which you can lounge and order from the spa menu. Why it's so great: Sebago Lake is a sneaky wonder, a massive body of water in the middle of Maine that feels like some hidden ocean. It's deep and cold and dotted with tiny islands and small beaches, and in the summer it becomes a boating haven. It's proof positive you don't have to hit the coast to get your summertime waterfront experience. Must-do: Set up camp at Migis Lodge, a luxe cabin retreat where you have private access to canoeing, paddleboarding, clay-court tennis, motorboating (supervised or not), water skiing, and sauna-ing in a tiny outdoor shack. This is the kind of place where they ring a lunch bell, and where the lunch turns out to be lobster rolls, and where you then go to dinner after cocktail hour and find a pile of steamed lobsters in the middle of the buffet table. Which is to say, it's pretty much perfect. Why it's so great: The largest freshwater lake west of the Mississippi, Flathead pulls in the boaters, the fishermen, and the culturally minded tourists interested in learning more about the Flathead Indian Reservation. Which is to say, it's a quiet crowd hanging in a quiet region of Northwest Montana. Transport us there now, please. 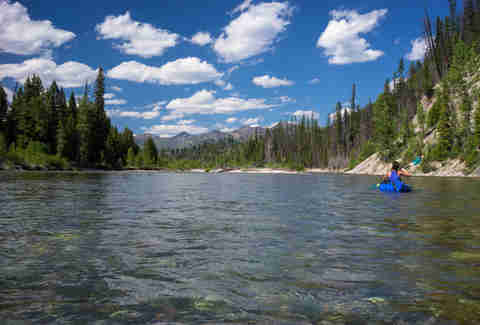 Must-do: Flathead Lake Lodge is an all-inclusive dude ranch on the water. Basically you'll spend half your time horseback riding and the other half sailing, then you'll retire in front of a massive stone fireplace every night after a dinner of roasted pig and buffalo. Dude. Why it’s so great: Honestly, you won't believe what you're seeing. The blueness of the lake -- the deepest in the US -- is so mesmerizing, and the cliffs surrounding it so overwhelming, that you can spend an entire vacay simply drinking it all in. Walk or bike the rim, take a volcano boat cruise, fish for rainbow trout, and otherwise give yourself up to a force greater than yourself. 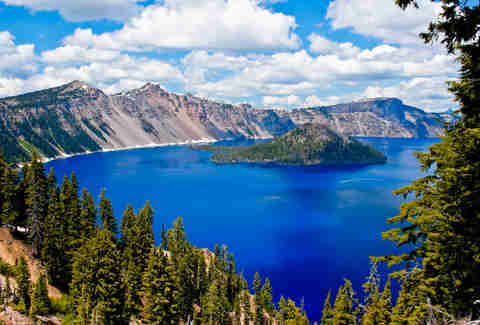 Must-do: Sure, the seasonal, century-old Crater Lake Lodge might conjure The Shining comparisons, but really it's one of those rustic, throwback retreats that forces you to really, truly unplug. There are no phones or TVs in the rooms, so it's all about slowing down and appreciating your environs. Oh, and hitting up the dining room at night to finally sample that bison meatloaf you’ve been curious about all these years. Why it’s so great: This is houseboat central -- but bear with us. Houseboats are actually cool: even a total boating neophyte can learn to navigate them after a quick lesson, and once you're aboard, you have a full-service hotel room on the water. 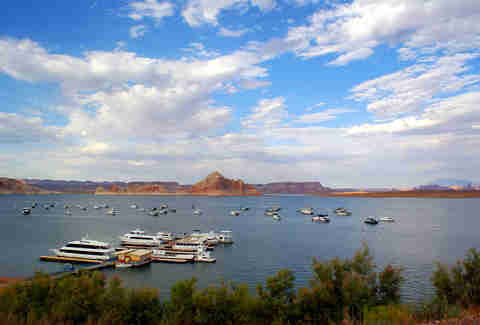 And houseboating on Lake Powell means you can cruise past epic red-rock scenery not accessible by foot, stopping to fish, Jet Ski, or cool off whenever you feel like it. 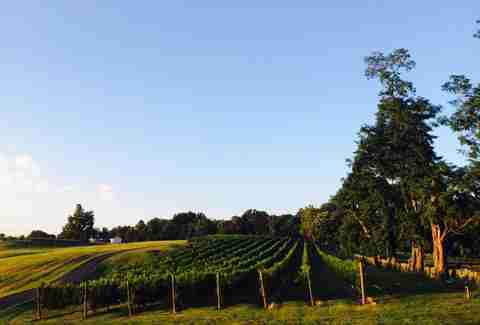 Why it's so great: So wait, there are more than 250 wineries and tasting rooms in Virginia spread across nine different regions? When did that happen? Well actually, hundreds of years ago, when Thomas Jefferson was determined to start a wine revolution in the state. It took a while, but within the last 20 years viticulture has taken off. Today you can spend days driving from Chesapeake Bay to Blue Ridge, sampling the chardonnays and cab francs the region is now most famous for. 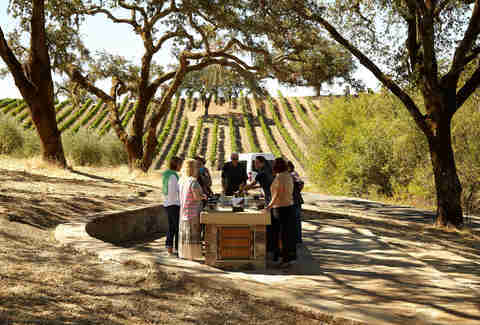 Must-do: Greenhill Winery is beyond bucolic: stone buildings, rolling hills, and the chance to buy a bottle of blanc de blancs. Wander down to the pond and set up a blanket for an afternoon picnic. Why it's so great: Because the snobs stay away, and the snobs ruin the party. 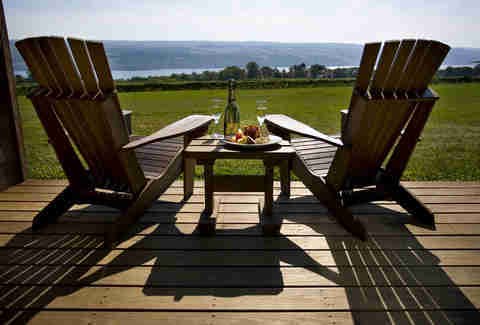 And also, because Finger Lakes rieslings are truly something to celebrate. Four distinct trails take you through bucolic scenery as you hit up the area's 100-some wineries, where the pours are generous and the staff uniquely accessible. Must-do: Not only is Cayuga Lake the country's very first wine trail, but it also includes distilleries and breweries as well as pretty epic waterfall views. Also: all of its wineries are dog-friendly. Why it's so great: Hint: it's not because of Sideways, it's in spite of it. Long before Alexander Payne poked his nose in, SB county was a refuge for any Angeleno in need of more wine and less smog. 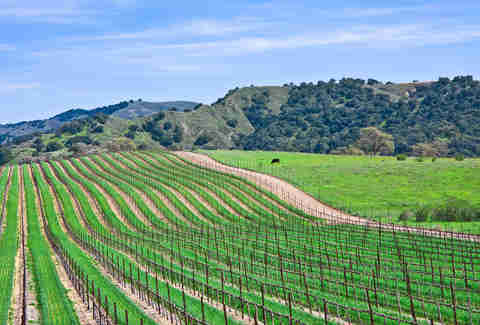 The drive between wineries is half the fun, owing to the hilly, tree-dotted vistas, but of course you're really there to taste your cares away at every open winery you can find, with the occasional detour into a mini-horse farm. Must-do: The windmill-y funkiness of Solvang always grabs the cover shots, but Los Olivos deserves equal attention. It's like a Western outpost come to life, what with the horse ranchers, except with sneakily sophisticated dining and tasting rooms aplenty. Meaghan Agnew is a Boston-based writer who pets strange dogs with impunity. Follow her on Twitter: @meaghandeth.